Rinse cranberries and remove any that are soft or white. Put cranberries into a pot and add water. Heat over high heat until mixture comes to a boil. Lower heat and boil gently for 10 minutes. Press cooked cranberries through a fine mesh sieve. Discard skins and seeds. Cool then store in refrigerator until ready. This can be made a few days ahead of time. Make a few cuts in the spaghetti squash. Microwave on high for 5 minutes. Turn squash and continue to microwave in 5 minute increments until squash is soft. Let squash cool. When cool, cut the squash open and remove seeds. Scrape out squash meat and weigh. Put squash in a food processor. Add 1 tsp of granulated sweetener (Swerve or Truvia) for every ounce of squash. Blend in the food processor for several minutes until the squash is smooth. 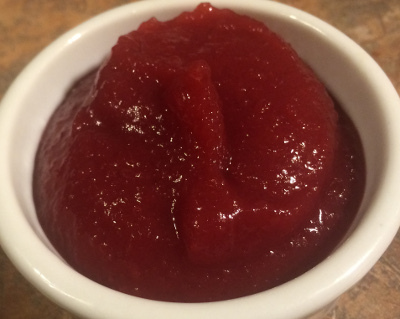 Add 1/2 ounce of cranberry gel for every ounce of squash and add 2 drops of liquid sucralose for ever ounce of squash. Blend for a few minutes to mix it all together well. Also try our Cranberry Ice Cream if you have left over cranberry gel.